It's like bringing Washington Theatre into your kitchen. Poach an egg with Molly Smith. Make a salad with Victor Shargai. Bake salmon like Erin Driscoll, stir your chili like Robert Aubry Davis, and be the big cheese with Tonya Beckman's brie. Other contributors include:: Eric Schaeffer, Artistic Director of Signature Theatre; performers Sherri Edelen, Kimberly Gilbert, Naomi Jacobson, Sean-Maurice Lynch, Donna Migliaccio, Tracy Lynn Olivera and Stephen Gregory Smith; playwrights Renee Calarco and Gwydion Suilebhan; Helen Hayes Awards founder Bonnie Nelson Schwartz, Helen Hayes Awards Founding Executive Director Betti Brown, and theatreWashington Prez Linda Levy; plus recipes that were favorites of Helen Hayes and James MacArthur. Every cookbook purchase gives the gift of support to Washington-area theatre professionals in need. 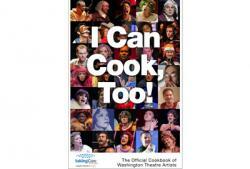 All proceeds from the sale of I Can Cook, Too will benefit Taking Care of Our Own, a program of theatreWashington. Click here to view a sample page from the book.